1. Season with salt, pepper, and mustard the tunaloin. Pan-sear until done and set aside. 2. Cut the lettuce into chunks, and the spinach too. 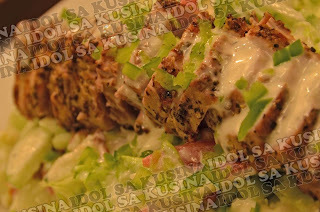 Place in salad bowl and top with seared tuna. Pour over the top with creamy lemon dressing. Garnish with tomato and cucumber. 1. Combine olive oil, lemon juice, salt, white pepper, mixing well until mixture becomes creamy. And lastly add mayonnaise.